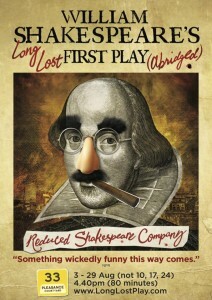 Premiering in DC & Coming to Edinburgh – It’s Shakespeare’s Long Lost 1st Play (abridged)! As part of the international hoopla surrounding the 400th anniversary of the death of William Shakespeare, the RSC’s tenth stage show William Shakespeare’s Long Lost First Play (abridged) is having its world premiere at the prestigious Folger Shakespeare Library in Washington DC. And in August 2016, the RSC will premiere #LongLostShakes in the UK at the Pleasance Courtyard as part of the Edinburgh Fringe Festival. American Theatre magazine featured a story on the script’s origins as part of its reporting on the events surrounding Shakespeare’s 400th “Deathiversary”. Read the article here! Buy tickets for Edinburgh here! Buy tickets for the Folger here!